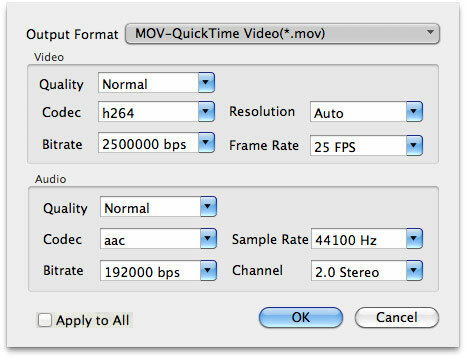 Guide: How to convert between popular video formats on Mac? How to convert between popular video formats using this video converter? The following will show you a step-by-step guide to complete conversion tasks. Free Download Video Converter for Mac and install it. To install it, simply mount the .dmg archive by double-clicking it, and copy the application to your applications folder (or wherever you want). 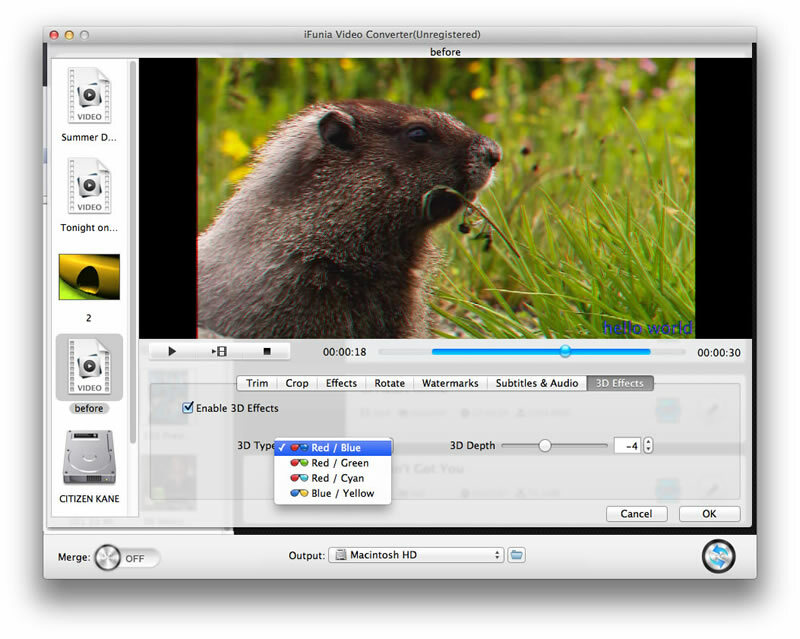 Tip 1: This Mac Video Converter supports batch conversion. It allows you to import several multimedia files at one time so that you can convert several videos in one go and enjoy fast conversion speed. Highlighting the file you want to convert, click the format adjacent to it, and a list would show up below which you can choose the format you want. If you want all the files to be converted to a same format, you can simply tick off the "Apply to All". Tip 1: Detailed video and audio settings are provided by this Video Converter for Mac for you to adjust, such as video Codec, Frame Rate, Resolution, Quality, Bitrate and audio Codec, Quality, Bitrate, Sample Rate, Channel etc. You can perfect the quality of the output video and audio by setting a higher bit rate and resolution, but the output file will be bigger. You can set a low bit rate to compress the video or audio. After you have set up all the conversion parameters, hit the "Convert" button to start converting. While converting video, you can preview the video and set the actions like shut down computer and open output folder when conversion completed. You can preview the each video and capture pictures in the Preview window. The three buttons from left to right are: Snapshot button , Play button and Pause button. To preview the whole movie, just click the Play button. If you want to take some images from the movie for future use, just click button Snapshot to take a snapshot. If you have several videos on your Mac and you want to combine them and export a continuous output video,you can slide the merge button to turn on or turn off the function. If you want to edit your video files, just highlight the video you want to edit and clicking the "Edit" image button, then you can do trimming, cropping, deinterlacing adjustment and adding watermark or special features to your files. Trim: Trim your favorite part from the video to convert for you portable devices. Crop: Customize the frame size (16:9, 4:3 or Keep Original ) and cut off black margins. Effect: Change Brightness, Contrast and add more effects to your videos. Watermark: Add image or textual watermark to videos. 3D video: Convert 2D video to 3D format by ticking off the box "Enable 3D effects", then you can choose a 3D type for the output video and set the 3D depth to get the perfect view.